This is the first review of my portfolio. For the first time, I am going to reveal my average purchase price. The stocks listed in my current portfolio achieve +9.7% total return since start 2014. The return could be higher if not for Vallianz falling 28.7% after reaching its peak last Dec and Super Group substantial decline of 21.3% due to the Thailand political chaos. Nam Cheong is the best performer with +43.5% total return. ComfortDelgro, Raffles Medical, Overseas Education and Suntec Reit all achieved a stellar 20% or more total return. 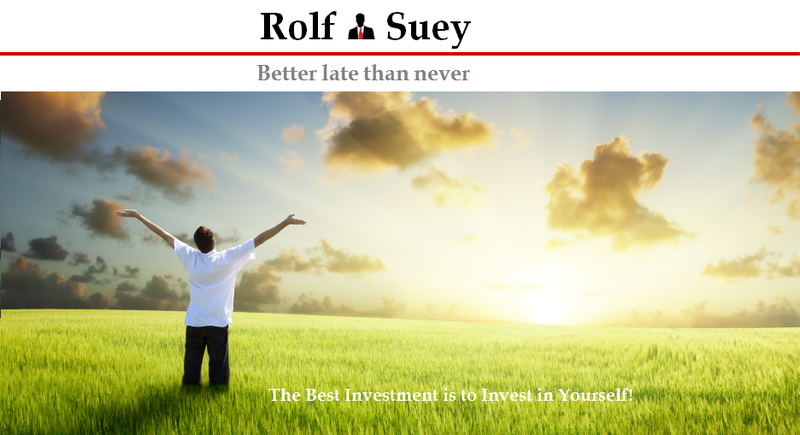 Rolf Suey's stock at cost, achieve +11.7% total return since start 2014. Note that this is based on unit share and not based on my actual portfolio. A mere three stocks register decline mainly due to trading expenses. 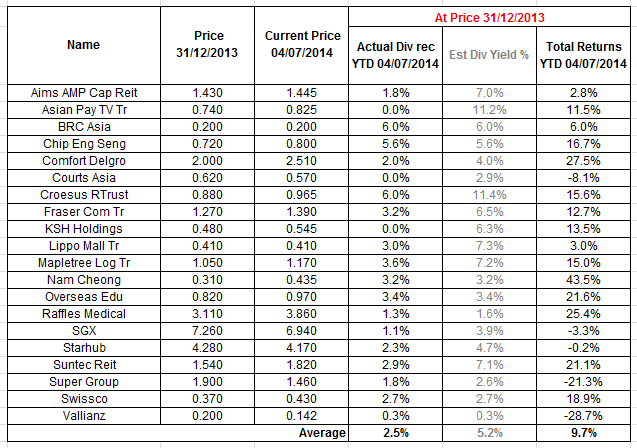 BRC Asia saw the largest fall of 2.9% but this will be offset by dividend yield in the next FY. 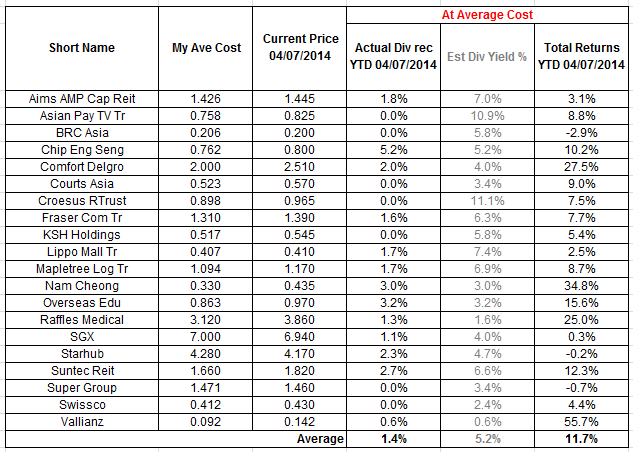 Vallianz is the best performer with +55.7% total return followed by Nam Cheong +34.8%. ComfortDelgro and Raffles Medical were also impressive, returning +27.5 and 25% respectively. Overseas Education, Suntec Reit and Chip Eng Seng all register more than 10% return with the rest of the stocks having +5-6% average return. This means Rolf's portfolio at cost is close to 6% above STI performance YTD. More than happy! Thanks for the comments. The portfolio is based on per share or uniform lot basis, showing company performance. My actual portfolio is higher due to heavier weights on better return stocks. Returns also include some of the profits realized for re-investments into other shares to mitigate and diversify risk. One such company is Vallianz which I mention in my earlier blog post of leaving profits in it, since this stock has inherent higher debt/ hence risk. I will be more transparent on my actual portfolio once time is ripe to reveal. I found your blog a month back while trawling the internet, trying to understand more on Oil & Gas & Marine industry. 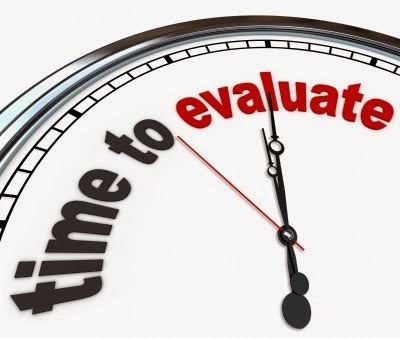 Your indepth analysis in O&G helped me a lot to understand the industry better. I notice your portfolio is quite defensive and well diversified (was sort of expecting it to be more heavily weighted towards O&G since you have indepth knowledge in that area). Heartfelt appreciation for reading my blog. If you require more insight of O&G&M industry, feel free to contact me. O&G is cyclical and possess "high risk, high return" trait. I am quite careful and selective in this sector, and strategy is to profit over shorter term and re-invest profits into more defensive stocks for long term. Having said that, I still have significant holdings within this sector, despite the few stocks. Overall, I am still a risk-averse investor. O&G&M business model/revenue recognising method are more complex and hence require more in-depth understanding of the sector and companies. This is also one of the reasons why, I am hoping to educate the public within my best knowledge. E.g. A tug is different from an AHTS, a Liftboat is different from a Drilling Rig, different shipyards/shipowners have very different characteristics and strategies.